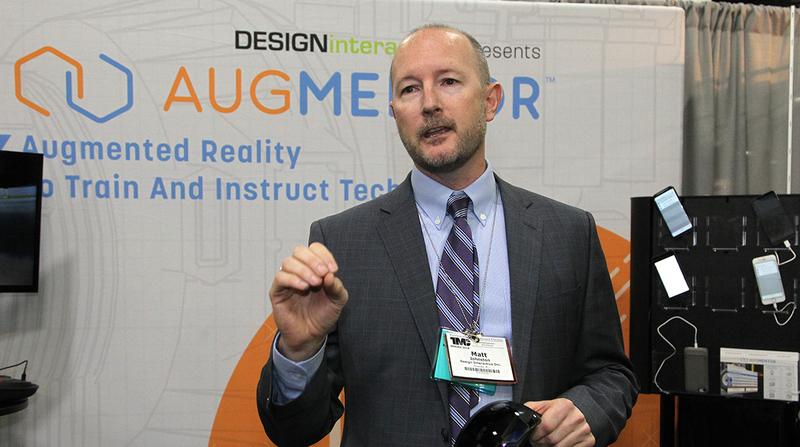 ATLANTA — Design Interactive announced that its Augmentor virtual and augmented reality technician training system is available for Apple and Android mobile devices. The development expands technicians’ access to the system’s repair information, said Matt Johnston, head of the company’s commercial solutions division. “Now, content like procedures and troubleshooting methods can be accessed from mobile phones across individual shops and multiple maintenance locations,” he said in a news release issued to coincide with the company’s March 18 press conference at American Trucking Associations’ 2019 Technology & Maintenance Council annual meeting. The mobile application includes an augmented reality mode that lets technicians visualize procedure steps where they are conducted, the company said. Users also can see 3D virtual representations of parts for reference during inspection or repairs. During a March 18 press conference, Product Manager James Morgan demonstrated how a representative image of a tire that was not roadworthy would appear on the phone screen while a technician was diagnosing a tire with similar issues. The mobile app also includes videos, audio messages and text instruction, and helps ensure technicians have access to updated content, Design Interactive added. “With the new ability to use Augmentor on mobile devices, fleets can deploy our transportation-focused training solutions more quickly and effectively to their technicians,” Johnston said.